Wood look and faux teak looks sharp and is easy to maintain. The faux teak material is durable and has a longer life than natural teak, which grays and stains over time if not constantly oiled and maintained. For these reasons, faux teak offers greater value for the restaurant and hotel owners with an eye on their budget. Faux teak is synthetic teak, or a resin based (plastic) material that is fade and mildew resistant. 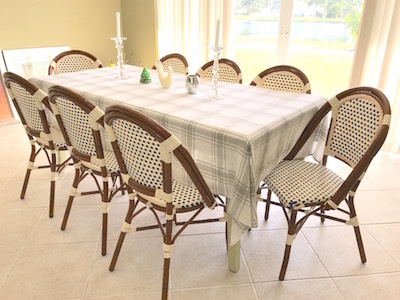 The faux teak slats for a table top or a chair seat or seat back are simply made out of ‘fancy plastic’ and held together with an aluminum metal frame. Faux teak, wood look teak, plastic teakwood and synthetic teak are all basically the same products. Depending on the manufacturer the furniture varies in style, quality and long-term durability. Because the synthetic teak is so popular you can probably find it at several locations close to where you live: restaurants, bars, bistros, cafes, hotels, poolside, country clubs, condominium and homeowner associations…and the outdoor dining and venue list goes on. Purchasing brown faux teak will surely add some pop and appeal to your restaurant, but at this point it is now the show stopper furniture line that it once was. For those seeking quality outdoor commercial restaurant furniture that will be a wow factor at their venue for some time is the gray faux teak. Gray faux or gray synthetic teak is the same teakwood look plastic slats with an aluminum gay. Many many design trends, the novelty is in the color variation. 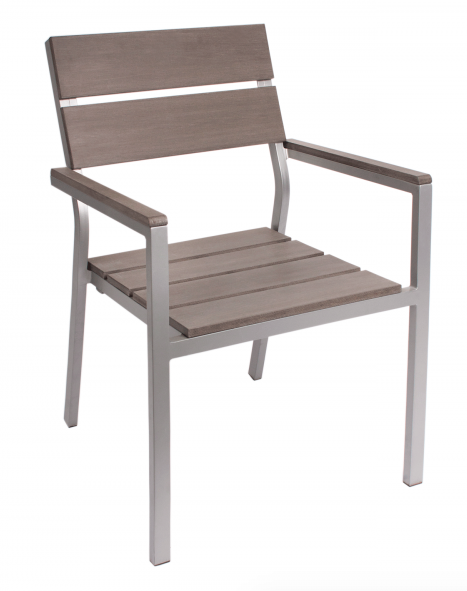 Gray synthetic teak is elegant and subtle with a black, gray or charcoal powder coated aluminum frame with a gunsmoke or grayish brown synthetic teak. 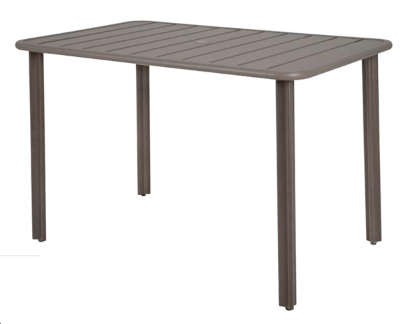 Whether you like the styling of BFM’s Sea Side tables and seating, Florida Seating’s DC200A or their gray synthetic teak option available on all their synthetic teak or Plantation Prestige’s Durango dining, side and bar seating, each product line is commercial quality and styling that you will love. To find out which fauxwood or synthetic teak option is right for your location call our experts at 610-994-1686. We will work with your restaurant’s budget, space and layout requirements and find the best solutions for your venue. Outdoor Restaurant Seating sells numerous materials in outdoor and indoor commercial restaurant furniture. Recently, many states like California have mandated that restaurants and other establishments make provisions for seating in dining rooms for those in wheelchairs. The spirit of these laws provides accessibility for those with limited mobility or disabilities, much like that of entrance ramps, tactile signs and other ADA (Americans with Disabilities Act) guidelines. Having ADA accessible tables not only enables a restaurant to comply with laws, but it also makes sense to provide greater access and comfort to all. A typical cafe table with a center table base is not ADA accessible. An ADA accessible table should have legs at the table’s four corners, provide 30” clear space under the table and 36” of uninterrupted space across the side of the table. Typical sizes for ADA tables that are commonly manufactured are 36” x 36”, 30” x 48” or 32” x 48”. People like being outside, and it is no wonder that people are now seeking more comfort in their dining and leisure experiences. This has been seen in the latest trend from urban rooftop gardens to suburban patio spaces. The hospitality industry is no different than residential trends. Hotels, restaurants, lounges, bars and other areas where people frequent for food, drinks and fun are racing to build, expand or improve their outdoor space. Sofa seating including three person sofas, love seats, arm chairs and other outdoor modular seating are now providing the experience that goes beyond the standard table and chair. Outdoor sofas and loveseats provide a comfort and intimacy for a couple or group like no other. 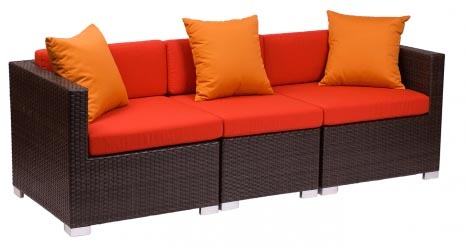 When choosing an outdoor sofa or loveseat for your location there are several considerations and materials and style. It is important to note that the products discussed here are all commercial quality and will perform well in any hospitable environment. Most all the commercial sofas and loveseats have aluminum frames. 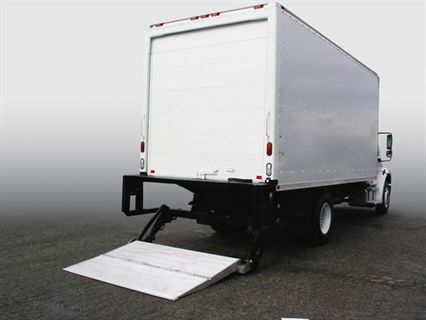 Aluminum is durable, lightweight and rust resistant. Depending on the style of the sofa the aluminum may be painted or/and anodized chrome. The GAR Products Seaside 831 outdoor commercial chair is a very popular item. As you can see from a happy customer's photo, the Seaside looks great indoors and outdoors. The frame is a rust-proof aluminum frame and seat pan woven with durable resin strands. The durable chair is appropriate for indoor and outdoor applications. The GAR Seaside 831 side chair is stackable and comes in a dark bamboo frame finish. The rattan style chair has a strong synthetic mesh seat back and seat. The woven color options include: black and cream, blue and cream, green and cream and burgundy and cream. If you are looking for matching outdoor barstools, the Seaside also comes in a similar style Gar Products Seaside 2831 which is identical, just higher at the standard bar height. If you are looking for bolder colors, the Seaside 832 has a similar frame but with less join wrapping and seats and backs in blue, black, burgundy and green. The Seaside 832 style is also offered in a bar stool. With the rise in popularity of outdoor dining many restaurants, hotels, condos and other establishments are looking to improve their outdoor dining experience. This includes the comfort of their commercial furniture, decorations, layout and flow of the area, and utilization of space. The Vista aluminum bench matches with the Vista family style offered by BFM Seating which includes the Vista table tops including the Vista outdoor ADA accessible 4-leg table, and Vista outdoor seating offered as a side chair, arm chair, and bar stool. The Vista bench offers seating for three and a hardware set to bolt down the bench is also available. 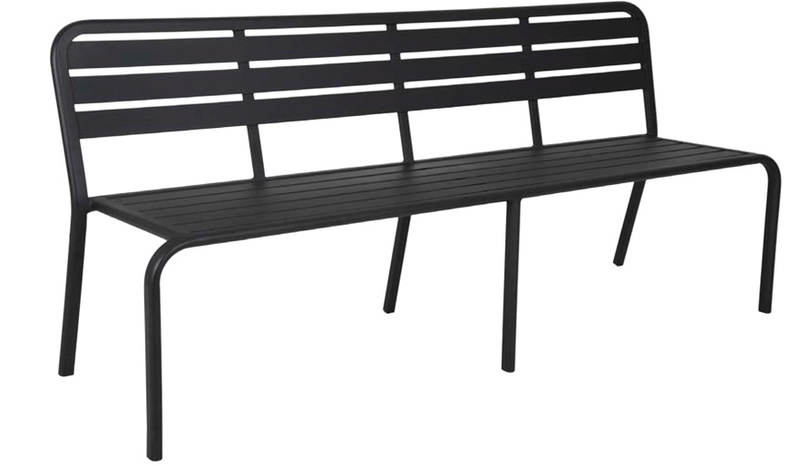 The bench is powder coated and available in a black or earth (dirt brown) finish. 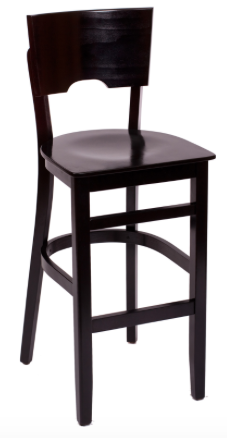 The commercial indoor wood restaurant bar stool is a mainstay at many hotels and restaurants across the globe. There are many shapes, styles and sizes and due to their popularity there are seating lines of wood side bar stools, arm bar stools, arm barstools and side bar stools that you can outfit your dining room with. This is important for many restaurant owners who want to get interior wood bar stools to match their wood dining room chairs. What is faux teak outdoor furniture? What is synthetic teak furniture? New Year, New Look, Same Great Outdoor Restaurant Furniture!